After a week of banging, cutting and painting, Readers’ CafÃ© â€“ the place to gather and to share â€“ has undergone an extreme makeover: blog style. Readers’ CafÃ© hasn’t been inspiring in recent months. 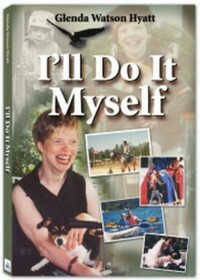 The topics weren’t inline with what I do, namely, writing about disability awareness and accessibility-related issues. And, I don’t feel there was any value or benefit to readers, which may explain dwindling participation. Rather than close Readers’ CafÃ©, I decided to remodel! (If, at first, you don’t succeed, try, try again.) Readers’ CafÃ© will still be held the first and third Wednesday of each month, 4-7pm pacific time, right here on the Do It Myself Blog. Participating in the conversation will still be as easy as posting a comment. What will be different is the format! The plan is to interview and chat with a featured guest on some aspect of disability and/or accessibility, and to have readers join in the discussion. Karen Putz will be our first guest this Wednesday, February 6th. Karen is the Deaf mom who was denied service at her local Steak & Shake drive thru because she didn’t place her order through the speakers, which she can’t use due to her disability. Her story was covered by two TV stations and has received some attention by the blogosphere. Most blog commenters have been supportive of Karen’s actions to go public with her fight for her rights, some do not fully understand what life is like when you’re Deaf and require some gentle disability awareness training, and a few others have been completeâ€¦well, sadly, there are still people in today’s society that need major attitude adjustments! Is this type of incident common for people who are Deaf or hard of hearing? What don’t most people understand about being Deaf or hearing impaired? What are some typical barriers you face daily? Some unenlightened souls say you shouldn’t even be driving because you wouldn’t hear sirens coming, and thus, are a safety concern on the road. How do you know when to pull over for emergency vehicles? As a person with a disability, surely you unfortunately encounter annoying and discriminating situation frequently. What was it about this particular situation that made you fight it rather than brush it of? What steps have you taken so far to advocate for your rights? You’ve used social media, like blogs and Twitter, to tell your story. What kinds of responses or results have you experienced? How have you managed to keep up with all of it? Hope you can join us Wednesday, February 6th @ 4-7pm pacific time. Feel free to tell your friends. If you have an idea for an upcoming featured guest, I’m all ears! DeafPulse.com - the one-stop pulse for all Deaf-related news and blogs. Ahh, i think you’re onto something here Glenda. I know I will be making an effort to show up regularly. Cheers. What an excellent theme for a blog. I came here through a link in RennyBA’s Terella. I am a social worker living (and working) in Norway and think that affirmative action and speaking out is a wonderful thing. Thankfully I think most of the hardships people come up against are because the general public is just not aware and has not set themselves in to the position of anyone who is different from them selves. Keep up the good work! Excellent idea, Glenda! I think this approach will make the Cafe much more compelling. I would love to hear Karen’s story. I’ll be out most of the afternoon but hopefully will be able to drop by for at least a few minutes between one thing and another. If I am not busy, I might join and my time zone is from 7 to 11 p.m. Eastern Standard Time. Thanks everyone! I’m excited and somewhat nervous about the new format for Readers’ Cafe. Hope everything flows relatively smoothly. The next Readers’ Cafe is Wednesday, February 20th. If you have an idea for a featured guest, please let me know.